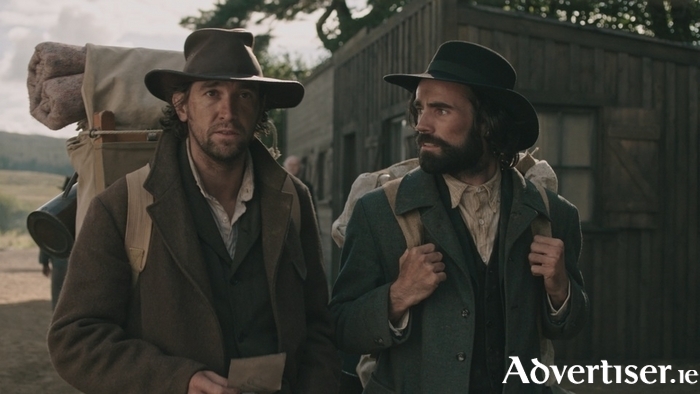 AN KLONDIKE, the first western made in Ireland, filmed entirely in Galway and the west, by Galway the based Abú Media, closes this year's Galway Film Fleadh when it is screened on Sunday at the Town Hall Theatre at 8.30pm. An Klondike tells the story of Irish emigrants the Connolly brothers, who travel from Montana to the Yukon during the Klondike gold rush of the 1890s, hoping to strike it rich. In the town of Dominion Creek, they become embroiled in a deadly feud with Jacob Hopkins, who runs the town, and when Séamus Connolly shoots Jacob’s son in a duel, Jacob vows revenge. The Connolly brothers are played by Owen McDonnell, Dara Devaney, and Sean T Ó Meallaigh. Other cast members include Siobhán O’Kelly, Séamus Hughes, Steve Wall, Ned Dennehy, Robert O’Mahoney, Megan Riordan, Bríd Ní Neachtain, and Native American actor Julian Black Antelope. The film has already attracted international interest and secured an international distribution deal with Content Media. As part of the production the mining town of Dominion Creek was constructed on the grounds of the Glengowla mines outside Oughterard. Production designer Padraig O’Neill and his team spent months researching and designing each building that makes up the town. An Klondike was written by Marcus Fleming and directed by Dathaí Keane. "I’m from Galway and have been coming to the fleadh since I was in school," says Keane. "To premiere my first feature here is a real honour. The west of Ireland landscape plays a vital role in establishing the visual tone of An Klondike. The desolate pine forests and lakes of Connemara are a perfect backdrop. The terrain in certain parts of the west is identical to the regions of the Yukon where gold was discovered." “With An Klondike we have created an ambitious, character-driven drama that has international appeal, but with a distinctly Irish edge," says producer Pierce Boyce. “As they would have done at the time, the Irish characters speak to each other in Irish and speak with the American and English characters in English."